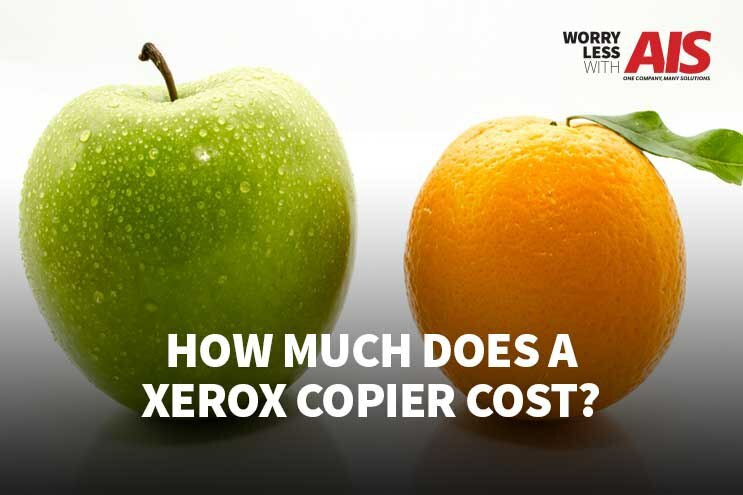 How much does a Xerox copier cost and how much should you spend on individual copier features your business might need? We ask you to take a step back and relate the cost of a Xerox copier with something more familiar. If you’ve ever bought a car before, think about the specifics you were most interested in while searching for that car. Did you have a price range or a budget you wanted to stay within? Were you curious about specific features or add-ons? How did you decide between a new and a used vehicle? Just like the purchasing decisions you made for your new car, purchasing a Xerox copier for your business requires some of the same research skills, planning, and assessment of your company’s needs. With all of this in mind, we created an easy breakdown of what you can expect to spend on a Xerox copier, using certain specifications, such as range of color, the print speed (ppm or pages per minute), and the scanning speed for each device (IPM or images per minute). As you probably know, there’s an overwhelming amount of Xerox copiers, printers, and multifunction printers on the market today, and narrowing down the best options for your business is challenging. We’ve done the hard work for you and researched Xerox copiers, categorizing them by price, color capability, print volume, and print speed. The most basic office printers Xerox sells range from $198–$319, with speeds ranging from 27-29 ppm. Since these printers are on the smaller side, they are best used for small to mid-sized workgroups and small business. Even though these printers are little, they are mighty! Some models can print up to 4,000 pages per month. If your business requires color printers or prints in higher demands, the Xerox Color Laser Printers range in price from $169–$5,849 and speeds ranging from 18-35 ppm. These printers are slightly bigger and little more powerful than the group above, designed for larger workgroups and higher printing demands. Is your business in need of a work center for printing and copying? These Xerox multifunction devices are great for higher printing needs, while also accommodating your budget. These Xerox printers range in price from $1,399–$2,278 and a printing speed ranging from 36–65 ppm. The last set of Xerox MFPs are ones for businesses with very high printing needs and heavy usage from your employees. These are the copiers that you find in 90% of all businesses—the workhorse of the business world that carry the largest load of copy and print volume. These MFPs range in price from $5,849–$100,000+ with printing speeds ranging from 30–125 ppm. Many of these MFPs can also enable business apps such as scanning to the cloud or email, printing from anywhere, and “pull-printing” capabilities. Just like a car, the more functionality, accessories, speed, quality of output, and the ability to handle more types of paper mean the rise in price. Depending on your office environment and volume needs, the lowest volume and cost device could be a perfect fit. Even better, you can mix and match devices and locations within your office to meet your printing and copying needs. “Business News Daily” published an article on the best office copier for your business you might find helpful, How To Choose the Right Copy Machine For Your Business. Did you choose an upgrade with your new car purchase? Maybe you wanted leather seats instead of cloth. The same goes for copiers and printers. Many of Xerox’s MFPs have a wide range of add-ons you can purchase for your machines that help with productivity and integration. Application Integration: MFPs can integrate with many business applications to help you streamline workflow, document management, provide cost control, and increase the security of your network and servers. Check with the manufacturer to see which applications can serve as great add-ons for the specific models you’re interested in purchasing. This can be done from a desktop, mobile device, or even the display panel using the easy to use interface. Paper Trays: Additional paper trays expand input options and double standard paper capacity, allowing longer uninterrupted operation. When you’ve got a big project to print and assemble, you’ll be glad to have extra paper trays to help out with collating and decreasing your overall production time. Finishing Options: Do you need to staple multiple documents, assemble booklets and reports, or create tri-folded materials and brochures? Finishing options are the best way to have your MFP do all of this work for you, and these options vary by copier model and manufacturer. Data Security: Unfortunately, copier and printer hard drives can be a source of insecurity because of the number of documents stored in the hard drive or even on the server. In today’s day in age, it’s vital all of your technology systems are always safely monitored and secure. Data security kits allow your documents to be digitally shredded and protected from outside hackers and cyber-criminals. Now that you’re a little more familiar with the costs and pricing associated with Xerox copiers, you might find yourself wondering which MFP is best for your specific business needs. 1. Total employees. How many employees currently use your office equipment? Does your company have multiple locations? What is everyone’s responsibilities that involve printing, copying, faxing and scanning? 2. Total volume impressions. How much and how often do you print? 3. Level of scanning. Do you need to scan documents? What is the expected volume of your scanned documents? Is scanning ad hoc or bulk? 4. Line-of-business applications. Do you need to scan-to-email or other frequently used business software? 5. Integration of existing infrastructure. Will your equipment fit seamlessly (or with minimal disruption) with your current print equipment? How easy is the ongoing management of the printing drivers with your IT infrastructure? 6. Workflow and document management needs. Ensure your equipment will operate with the software you currently use or are looking to implement. 7. Configurations. What add-ons do you need or interested in purchasing? Deciding on which Xerox office copier is a big decision you’re faced with making and it all depends on your individualized and overall needs and goals as a business. It's never as simple as just buying a copier. Like any technology, your copiers and printers are business tools, and it’s up to you to decide what do you want to accomplish with them. Interested in learning even more about pricing and costs when buying a copier? Read our article, How Much Does a Copier Cost? A Quick Overview. AIS recently partnered with Xerox and is now authorized dealers of Xerox’s products. To learn more about our partnership as well as other additional apps you have access to, click here. Visit our Office Copy Machine Ultimate Resource Page for additional info on the costs and pricing associated with copiers, and just about anything else related to your copy machines. At AIS, we’re dedicated to informing and educating you on the best ways to grow your business through your everyday technology. Knowledge is power and the more you know about the best technology businesses practices, the better off your business, and your employees will be. If you’re interested in learning more about copiers and printers, or any of the other technology services we provide, speak with one of our business technology consultants, here. Don’t forget to check out our channel on YouTube, The Copier Channel. We’re here to give you peace of mind to help you win more business. XEROX is a registered trademark for photocopiers manufactured by Xerox Corp.